Jess’ flights into Michigan kept getting delayed, so when I saw her for the first time in nearly 3 months at my airport, it was almost midnight! For the whole time she was here I kept thinking wow, Jess is in Grand Rapids, this is a dream. After settling into the river, she was thrust right into snarf’s sporting world with the opening Michigan-Notre Dame game. 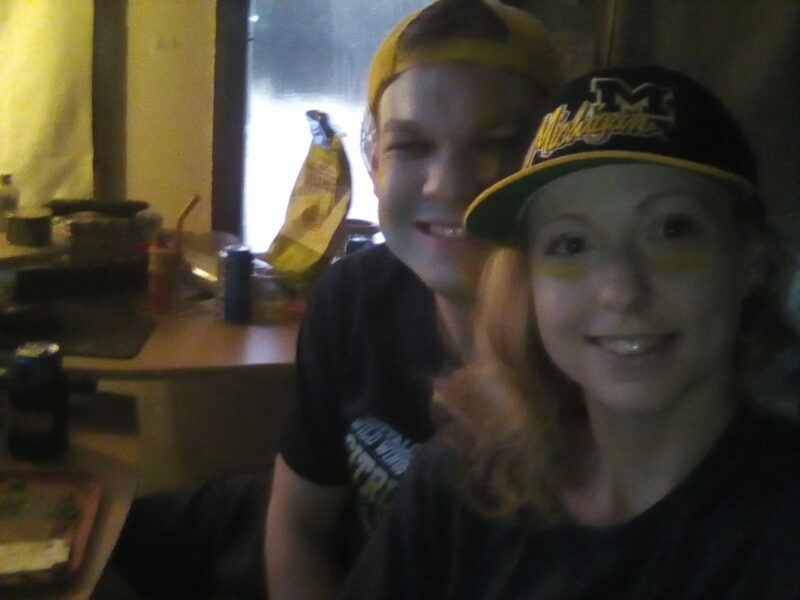 We got our asses kicked lol, but she painted her face and the Wolverines haven’t lost since, winning three more times while she was here by a combined 150-33. We spent a lot of our time at my mom’s, where her new apartment was an awesome place to have some privacy. My favorite part about being with my girlfriend is the regular life. Her smile from the time I wake up makes me want to tackle the day. I have nine screws in my right foot, and the second she left I could feel them ten times worse. I can’t wait to have our own place and get to live together, making meals, falling asleep next to each other. I am eternally grateful my mom let us use her spare room. 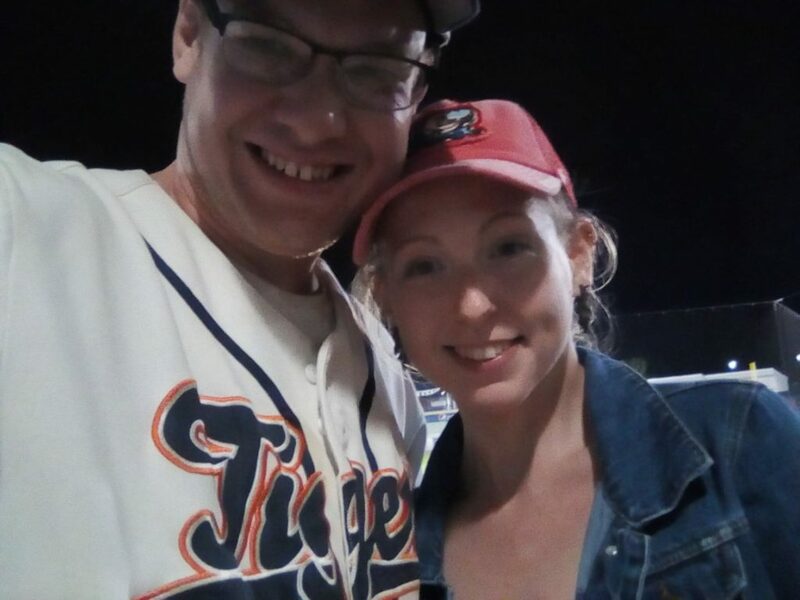 Before we knew Jess would be here for some extended stay, the trip was going to conclude and I took her to a baseball game. The Whitecaps had won their final game of the season, which we listened to outside on the radio, in dramatic walk-off fashion to force a playoff birth. We watched our team win 6-0 vs. the top seed, and we ended up winning the series. I feel so lucky we got to lock in an array of memories both at home and around the city. GR is big, but not as overwhelming as Chicago or Detroit. It’s kinda perfect. With some bonus time together, I took WonderWoman on a tour of my childhood, starting at my preschool Temple Emmanuel on the way in! It was very emotional and felt like a catharsis seeing places that hadn’t even changed. The main stop was the house I grew up in. 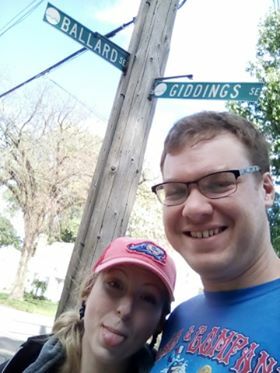 Like I said, it felt like a dream, the street I wrote a book about, walking down it hand in hand with the most beautiful woman Ballard Street had ever seen. It was perfect end of summer weather. So we kept going, stopping by the apartment my dad, brother and I lived in longer than anywhere. There were STILL rocks Ethan and I collected on the nearby railroad tracks lining the bush of our old spot. It made me realize that although all those places hold a spot in my heart, they aren’t home anymore. That’s wherever I am with Jess, and I couldn’t have gone through that old journey without her. I could go on and on about everything we did, but I’ll focus on our final date: the art prize downtown. Every year artists from all over the world place their exhibits throughout the city, many of them remaining forever. 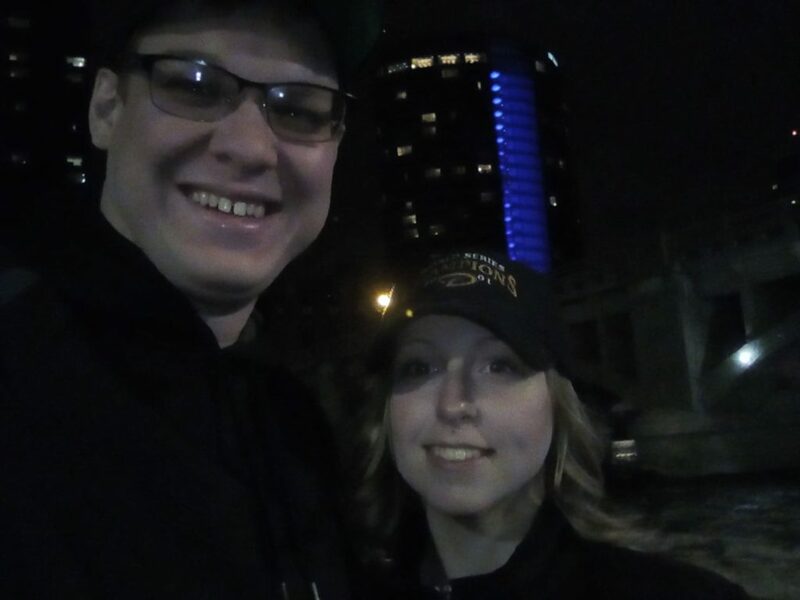 We went on a cool night (fall was on the horizon) and it enabled us to see not only everything that had lights in gorgeous fashion, but Grand Rapids itself, sparkling on the river. I loved it. I felt so at peace walking around with Jess. We were getting kinda cold and hungry, so we found a pizza place to eat at outside. It’s just a joy everything the two of us do. I remember thinking it’s pretty chilly as we waited for our food, but as long as she was game to sit out there, so was I.
I kept searching for a way to say this to her before she left, and I finally did. I can’t wait to marry you someday, babe. You flew 2,000 miles just like I did, no one can ever tell us what the other’s world is now. We know it. So this time, as I watched Jess’ plane takeoff, sure, I sobbed. But I knew in my heart we had really done something, something no one could touch or take away. I love you, Jess, and I can’t wait – we can do anything!